All three of the papers work within an analogical framework, which is they rely on analogies from experimental research to interpret use-wear traces on archaeological samples. The principle of uniformitarianism (formation processes happening in the past are still relevant today), which is a fundamental principle underlying experimental research in archaeology, underlies all of their arguments. The principle of uniformitarianism raises a number of methodological and theoretical concerns in experimental research. The first is how much like the Stone Age contexts do weapons experiments need to be in order to be valid in archaeological research. The authors appear to have mixed feelings about this particular issue and advocate, in the studies they cite, a variety of experiments ranging from those trying to recreate ancient conditions and those trying to control as many variables as possible in laboratory-like conditions. All these papers acknowledge the wide range of parameters affecting use-wear formation and the difficulty of dealing with processes of equifinality in use-wear identification. This is a fundamental reason why controlled, measured, and replicable experimentation in weapons research are absolutely crucial right now. Yet, we sit at a junction in weapons experimentation where it appears a dialogue between both of these forms of experimental research would be most productive. Weapons experiments have shown, perhaps more than most other field of experimentation, how a back and forth between lab and field can produce fruitful results and significant insights into wear formation. The second issue concerns the underlying reference collections that are used to infer similarities and differences between experimental procedures and archaeological collections. This is particularly relevant to debates about what ‘types’ of weapon armatures (spears, arrows etc.) are represented by different artefact morphologies. All three papers are explicit in acknowledging the fact that form does not equal function for stone artefacts. Yet, morphological methods such as the Tip Cross Sectional Area (TCSA) are still widely employed in many of these studies despite the fact that the underlying ethnographic and experimental data from which these reference measurements are derived are themselves widely variable and overlap considerably with each other (see Figure 3). This fact makes distinguishing weapon types based on morphometric techniques such as TCSA values alone highly tenuous. 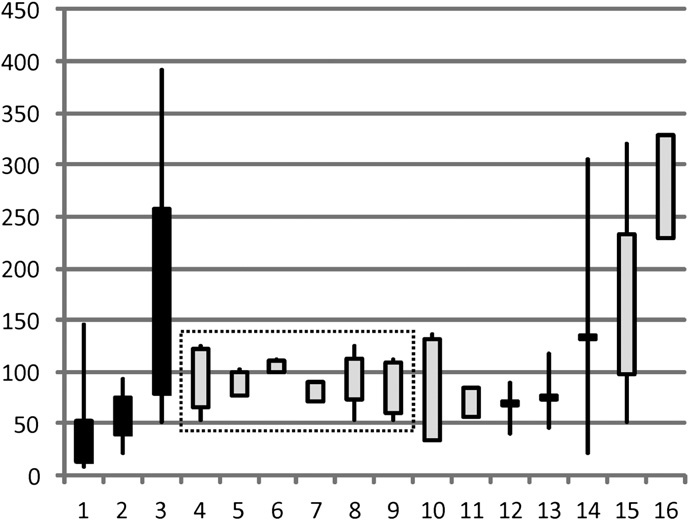 Figure 3: Box-and-whisker plot of the Tip Cross Sectional Area (TCSA) values (mm2) for stone projectile points. 1: Arrowheads; 2: Dart tips; 3: Spear tips. Remaining numbers are TCSA values for archaeological stone tools (From Lazuen 2012). The third issue is how to judge the reliability of archaeological interpretations of weapon use and the experimental reference collections from which they are derived. All these authors agree that large reference collections and archaeological assemblages are essential for sound inferences. However, how large is large enough, and what methods are viable for analyzing these larger samples? Clearly these are issues that concern how use-wear traces are quantified and fall into the realm of statistical analysis. In this sense, Wilkins et al. come closest to addressing the issue by explicitly stating their desired statistical alpha value (0.05) for determining significance using an assemblage level (rather than individual artefact) approach. The use of statistical principles in determining the significance of wear-traces and in determining their comparability between researchers is a prominent component of the debate played out in these three papers. Traditional use-wear approaches are time consuming and difficult to achieve large sample sizes with, but fortunately these issues are the focus of attention for a new generation of use-wear analysts (see for example http://www.danielleamacdonald.com/?page_id=11). One means of achieving larger experimental sample sizes for comparative analyses is to create a bank of inter-analyst reference collections produced and recorded using standardized protocols. References included in the Lazuen paper suggest that large experimental collections (see González-Urquijo & Ibáñez 1994) exist that could provide a useful starting point for such a databank (also see Shott 2014). No one can deny the contemporary importance of ‘big data’ in academic research and experimental archaeology could benefit equally from a big data approach and the methodological rigor it entails. A fourth aspect concerns the identification of wear traces. Much of the debate in these three papers concerns how wear-traces are diagnosed, with the obvious implications for how function is assigned to specific artefacts. Identifying bending initiations, a key component to the Diagnostic Impact Fracture method, is particularly prominent in these papers (see figures 4 & 5). The need for greater use of blind testing, especially involving experimental collections made outside of ones own lab/research facility, and control samples in weapons experiments is clear after reading the debate as it stood in these papers. All the authors would likely agree that analysts need to be experienced to correctly identify use-related traces and to differentiate between these and traces related to non-weapon factors such as animal trampling. Exactly how much experience again is not clear, but this is surely something that could be achieved with a collective workshop designed to expose researchers to a wide variety of experimental collections and different opinions on wear-trace identification. Similar such workshops have been held in the past and it seems the time is right for an updated version. 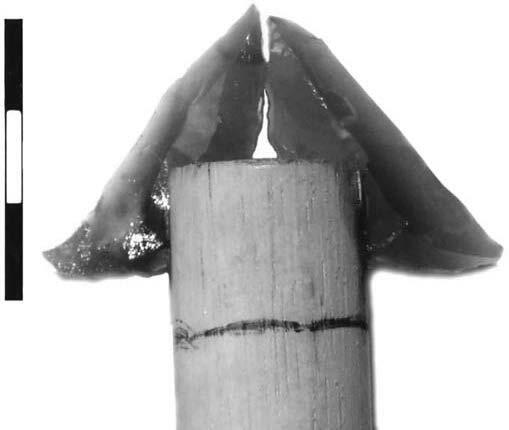 Figure 5: Image from Rots & Plisson (2014) showing impact fractures from non-weapon use. All of these are the product of drilling, knapping, or butchery. Collectively these three papers highlight a number of issues that will no doubt stimulate future experimental work and contribute to ongoing debates about the role of weapons in human behavioral evolution. González-Urquijo, J., Ibáñez, J.J., 1994. Metodología de Análisis Funcional de Instrumentos Tallados en Sílex, Universidad de Deusto, Bilbao. Lazuén, T., 2012. European Neanderthal stone hunting weapons reveal complex behaviour long before the appearance of modern humans, Journal of Archaeological Science 39, 2304-2311. Lazuén, T., 2014. Please do not shoot the pianist. 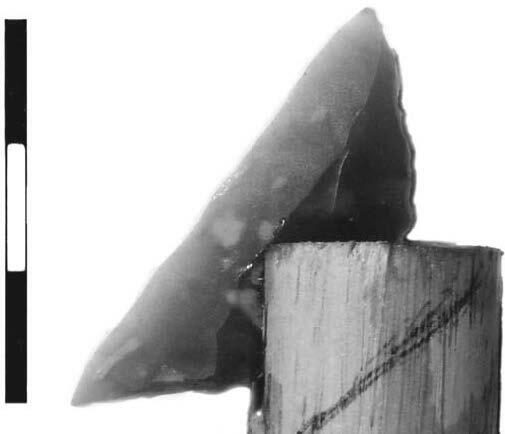 Criteria for recognizing ancient lithic weapon use, Journal of Archaeological Science 46, 1-5. Pargeter, J., 2007. Howiesons Poort segments as hunting weapons: Experiments with replicated projectiles, South African Archaeological Bulletin 62, 147-153. Rots, V., Plisson, H., 2013. Projectiles and the abuse of the use-wear method in a search for impact, Journal of Archaeological Science. Shea, J.J., Sisk, M.L., 2010. Complex Projectile Technology and Homo sapiens Dispersal into Western Eurasia., PaleoAnthropology, 100-122. Shott, M.J., 2014. 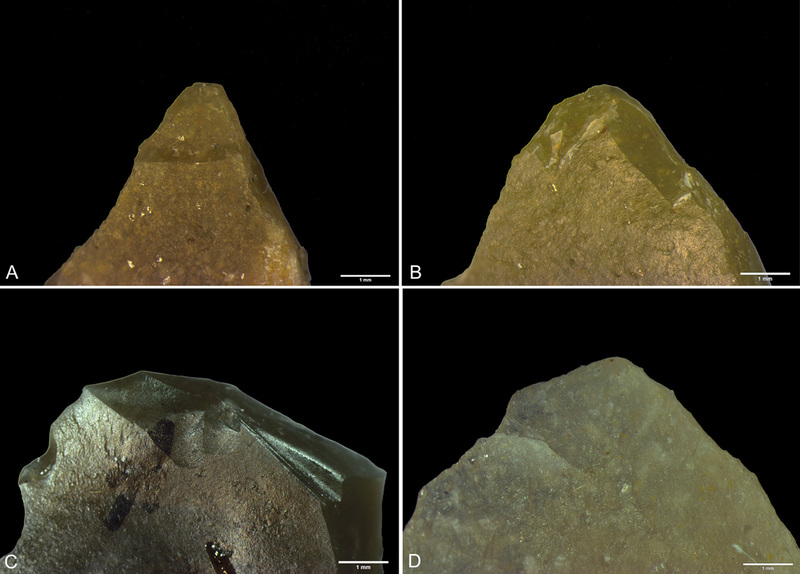 Works in Stone: Contemporary perspectives on lithic analysis, in: Shott, M.J. (Ed. ), Works in Stone: Contemporary Perspectives on Lithic Analysis, University of Utah Press, Salt Lake City, pp. 1-11. Wilkins, J., Schoville, B.J., Brown, K.S., Chazan, M., 2012. Evidence for Early Hafted Hunting Technology, Science 338, 942-946. Wilkins, J., Schoville, B.J., Brown, K.S., Chazan, M., 2014. Kathu Pan 1 points and the assemblage-scale, probabilistic approach: A response to Rots and Plisson,“Projectiles and the abuse of the use-wear method in a search for impact”, Journal of Archaeological Science. Williams, V.M.E., Burke, A., Lombard, M., 2014. Throwing spears and shooting arrows: preliminary results of a pilot neurological study, South African Archaeological Bulletin: Field and Technical Report 69, 199-207.